Martha Kearey dressed in black for the rest of her life in memory of the four sons she lost in the First World War, proudly wearing each of their medals in turn on Sundays. 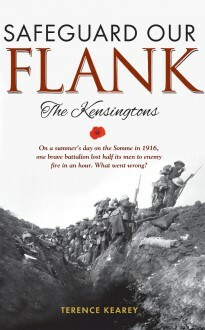 Nearly a century on, her grandson Terence has set out to do justice to the memory of his uncles and their colleagues with a full account of the role of their Battalion, the Kensingtons, on the Somme in the summer of 1916. The Kensingtons, guardians of the right flank on the battlefront at Gommecourt, were ordered to march on the enemy without proper preparation in a move later condemned as foolhardy and suicidal. That summer’s day, cut to pieces by enemy artillery, they lost half their men in less than an hour. Kearey sets out a candid account of the action, examining why this tragic and unnecessary slaughter was allowed to happen.